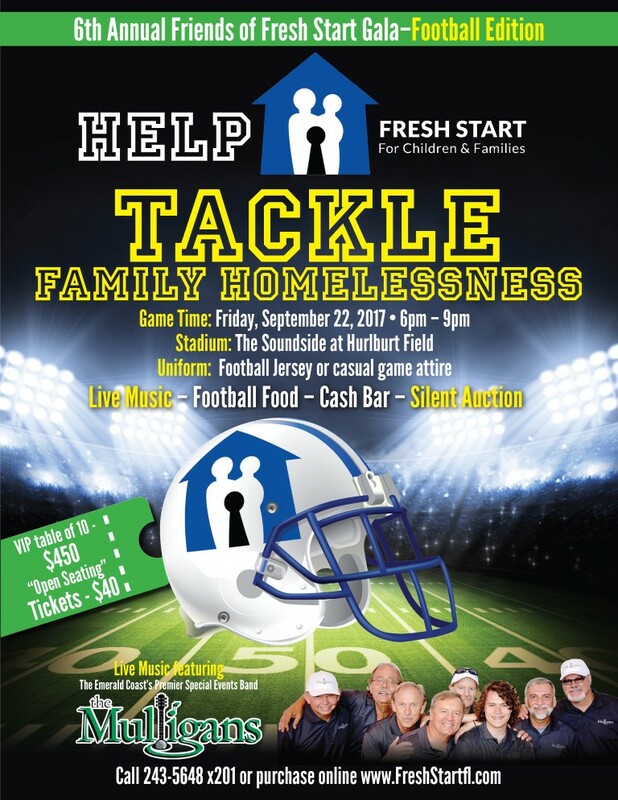 6th Annual Friends of Fresh Start Fundraiser: Football Edition! The Mulligans classic rock band will perform live at the 6th Annual Friends of Fresh Start Gala on Friday, September 22, 2016, from 6 p.m. – 9 p.m. Due to last year’s sellout performance, the concert will be held at a new venue. Come ready to dance in your favorite team colors or jersey at The Soundside club in Hurlburt Field. In addition, to live music by The Mulligans, the event will include both live and silent auctions, football fun, heavy appetizers, gourmet cupcakes, and a cash bar. The Mulligans are a local’s favorite, known for their 60s and 70s playlist, their philanthropy, and their diverse band members. From a CEO/Businessman (founder Edwin Watts) to a Marine Corps fighter pilot and airline pilot, a professional musician to a Navy EOD Specialist to a Pastor, the Mulligans share a love of music and a passion for performing. The benefitting charity, Fresh Start for Children and Families, is a 501(c)(3) nonprofit organization that has housed families in crisis, helping them achieve self-sufficiency for more than 30 years. Last year alone, Fresh Start responded to nearly 11,000 calls for help with free or reduced housing for 175. The organization is funded in part by United Way of Okaloosa and Walton Counties, area churches, and through the Repeat Street Thrift Store located at 10 Walter Martin Road in Fort Walton Beach. Tickets are $40 for open seating, $450 for a reserved table of 10, and MVP and Touchdown Sponsorship opportunities. For more information, call 243-6548 x201, or refer to the Fresh Start or Repeat Street Facebook and web pages: http://www.FreshStartFL.com.